As freezing weather enveloped parts of the nation, one Russian fitness blogger took matters into his own hands and turned the winter into his friend. 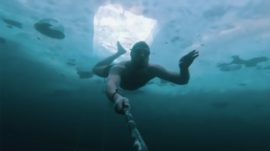 The blogger, Yegor Lesnoy, channeled his inner Iceman as he filmed himself diving under the frozen ice of Lake Baikal in Siberia, where temperatures dipped to minus 30 degrees Celsius. The lake, he claims, was a balmy 1 C.
“I simply swam 10 meters under the ice of my favorite lake and came up absolutely happy, refreshed and healthy,” Lesnoy wrote in a post published Monday. Lesnoy’s Instagram account features similar winter-themed footage, including fitness routines performed underwater. “What can be better than going out on the porch in the morning, breathing in the frosty air so that the snot freezes in your nose?” he writes in one of the posts.